If you're looking for a way to incorporate environmentally cleaning practices into your daily routine, you'll be excited to see the result of this Scotch-Brite Greener Clean product review. The folks at Scotch-Brite recently sent me a selection of items from the Greener Clean product line to test. I can truthfully say that I was very happy with the results and will continue to use the products in my own home. Scotch-Brite's Greener Clean product line is designed with the needs of today's consumers in mind. The products are high quality, effective cleaning tools that are made in an environmentally responsible manner. To begin with, each item in the product line is reusable, therefore providing options for taking care of home cleaning tasks without resorting to the use of single-use disposable products. However, the fact that Greener Clean products are reusable is not the only reason that they are an environmentally desirable option. Each item in the product line is made from natural fiber, such as agave and corn. Additionally, some of the products contain post-consumer materials. Product packaging is made from recycled materials. 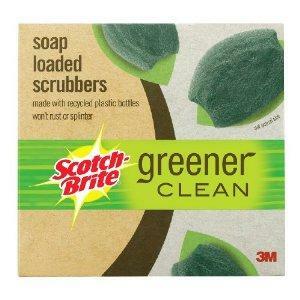 I tested three of items for this Scotch-Brite Greener Clean product review and was quite impressed with each item. I used one of the Greener Clean scouring pads to clean up a pretty messy casserole glass dish and was very pleased with the results. The dish contained residue from a gooey casserole that had been cooked at a high temperature, so it was quite messy and I expected it to be difficult to clean, particularly with a cleaning tool made partially from an agave plant. I was pleasantly surprised to find that cleanup was quite easy. This natural scouring pad worked as well for this type of cleanup job as any other cleaning tool that I've used for a similar purpose. Like traditional Scotch-Brite sponges, the Greener Clean version made from natural fibers features a soft, absorbent sponge on one side and a rougher, scouring pad on the other side. As with the scour pad described above, the abrasive portion of this item are made partially from agave plants. The absorbent sponge portion of the tool is made from a combination of recycled paper and natural materials. I have long used regular Scotch-Brite sponges, and I noticed no difference in quality or function between this more environmentally friendly version of the product and the one I usually use. The Greener Clean Soap Loaded Scrubbers also work very well. They are small, oval shaped sponges that are mildly abrasive. They are pre-loaded with biodegradable, phosphorous-free soap for maximum convenience. They are similar to pads in concept, but they are less abrasive. They are designed to be non-scratch and are actually made from post-consumer plastic bottles. They are effective for all kinds of household cleaning tasks, indoors and outside. I used one of mine to clean my resin patio table with great success. If you're looking for a way to start making a big difference in your family's environmental impact by making small changes that don't cost much - or may even help you save money -- you can't go wrong with any of the items in Scotch-Brite's Greener Clean product line. They're economical, effective and environmentally friendly. What could be better than that? To learn more about this line of environmentally friendly cleaning products from Scotch-Brite, the Greener Clean page on the company's website.